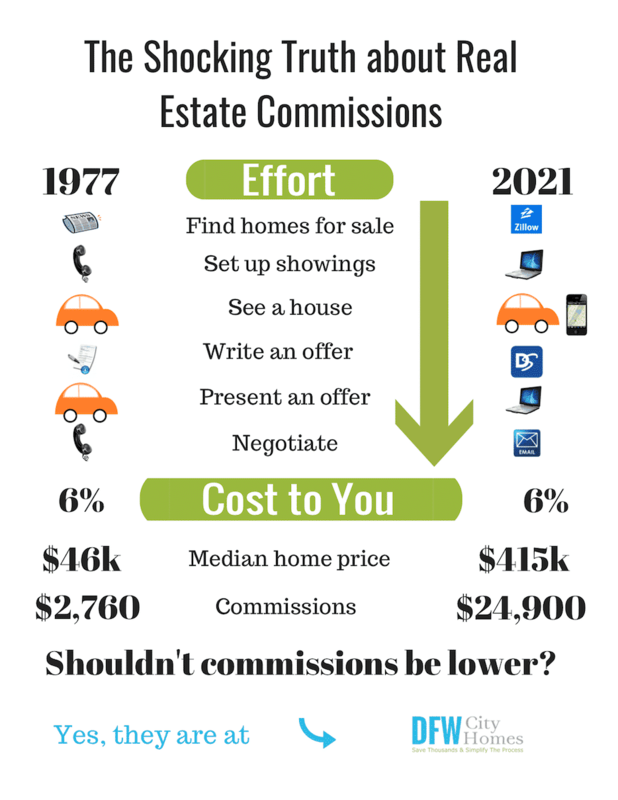 Shouldn’t Real Estate Commissions Be Lower? In Wylie Texas, the Internet has made the job of a real estate agent much easier and less time-consuming. Agents don’t have to jump in the car every time something needs to get done. The 6% real estate commission system designed in the 1970’s, is still upheld by many brokerages. More than ever before, representing buyers and sellers is a tabletop business and escalating home prices don’t justify higher commissions. Researching the market is no longer an Easter Egg Hunt where only the agent knows where the homes for sale are. Tools, technology, and rules of fairness have made finding homes, writing contracts, negotiating, presenting, and executing contracts, more efficient than ever before. DFWCityhomes is an established Flat Fee MLS listing Service and Full Service real estate company that represents buyers and sellers at a fraction of the cost. Our clients receive a full service experience with agent representation at all service levels and our simplified process is hassle-free, proven, and effective. Interested in learning more? We’d love to help you meet your real estate goals. Click MLS Listing Services or Buyer Rebate Services to see how we may help you. Get in touch with us at Contact Us or Call (214)-207-0210 and we will explain to you how our services can save you time and money. Wylie, Texas is one of the fastest growing communities in the State of Texas with a 120% increase since 2000. Possessing an outstanding school district, a low crime rate and an expanding business climate, Wylie is the ideal place for people looking for a small town environment with easy access to big city amenities. The Wylie ISD, in partnership with parents and the community, provides all students a world-class academic education which will prepare them to lead successful and productive lives. Wylie is a city once solely located in Collin County but now extends into neighboring Dallas, and Rockwall counties in the U.S. state of Texas.